Enniscorthy, Ireland, 1952. 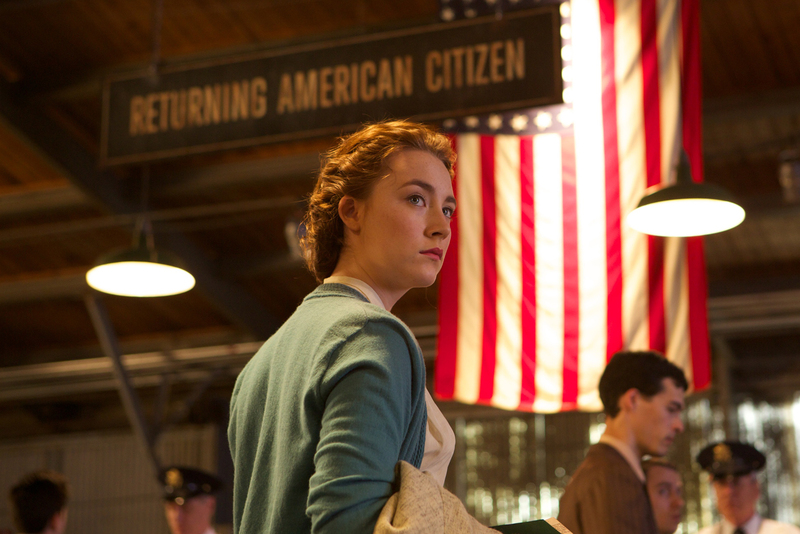 With the help of her older sister Rose (Fiona Glascott), young woman Ellis (pronounced Ay-lish) Lacey (Saoirse Ronan) has organized to leave her quiet town life for the chance at a more fulfilling one in Brooklyn, USA. In her journey to establish herself in this new world, Ellis lives at an Irish boarding house, takes up a job at a department store and enrolls in a night-time bookkeeping class. Along the way, Ellis encounters softly spoken Italian-American Anthony ‘Tony’ Fiorello (Emory Cohen) and a romance quickly blooms. However, family circumstances back home in Ireland have changed in her absence and Ellis soon finds herself in a tug of war, torn between two worlds. Brooklyn is one of those films that works well enough, it’s both watchable and entertaining, leaving viewers on the positive — nothing more, nothing less. An adaptation of the 2009 novel of the same name by Colm Tóibín, the screenplay, by popular English author Nick Hornby of High Fidelity and About A Boy fame, is perfectly serviceable and director John Crowley, Boy A (2007), keeps the pace going at a steady rate, capturing that unsettling nature of leaving home to live abroad. On a production design level, there seems to have been a conscious effort to be minimalist for budgetary reasons and a few exterior scenes in America seem a little lesser for it. It may sound as though I’m being nitpicky, but a significant aspect of this story is about the experience of immigration to a new land — from wander to normality and back to a renewed sense of normality and idea of ‘home.’ The overall aesthetic results in something resembling a decently polished midday TV movie opposed to a personal epic of the screen. On its lead, while actress Saoirse Ronan certainly has a few duds on her CV — who actually saw Justin and the Knights of Valour (2013)? — the fact remains that she’s always delivered a worthwhile performance. While Brooklyn is far from a bust, and indeed Ronan performs well, it did make me wonder how she ended up in a rather simplistic role when she’s capable of so much more complexity and depth — who could forget her breakout performance in Atonement (2007)? The character of Ellis runs the usual gamut of melodrama — sweet and sad being the prominent feelings here, but she never quite soars, despite all her efforts. On the supporting front, things tend to waver on a passable level. Side characters like Ellis’ snooty boss Miss Fortini played by Jessica Paré, Mad Men (2010), as well as Emily Bett Rickards, Arrow (2012), and Nora-Jane Noone, The Descent (2005), as giggling boarding house gossipers Patty and Sheila respectively, playing things a little on the cartoony side. Jim Broadbent, Moulin Rouge! (2001), who portrays Father Flood has a firmer presence but doesn’t have much to do. In fact, on reflection, most of the support cast have little to do here thus don’t leave any sort of lasting impression. To put it simply, there isn’t a lot to Brooklyn. It’s a quaint, pleasant romance with the occasional moment of attempting depth. Its overall feel is less cinematic and more daytime TV-ish, with a strong effort not to offend old-fashioned conservative sensibilities — in other words, inoffensive fluff. If that sounded like a dig, it actually isn’t really. I do think the film has an audience. Whether this audience will want to fork out good coin to catch Brooklyn in theaters or wait for the inevitable small screen broadcast though is another question altogether.